The Bisque Imports crew is excited to introduce our new distribution center in Dallas, Texas. We are currently stocking over 2,000 of our top items in Dallas. 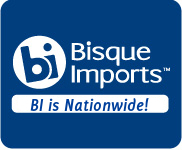 The Bisque Imports crew is excited to introduce our new distribution center in Dallas, Texas. Our new and improved shipping process is hassle free. Simply place your order the same way you've always done. We do all the work for you! 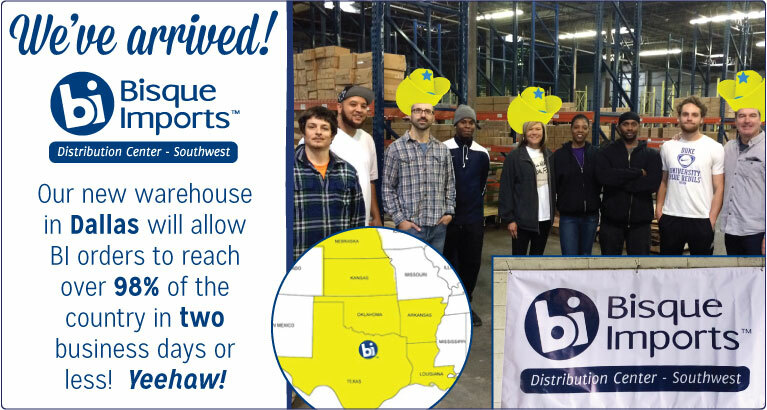 Here's how it works: if you're located in one of the 6 states serviced by BI Southwest, you will receive the bulk of your order from that distribution center in 1-2 business days. Any remaining items not currently stocked in Dallas will be shipped as a separate order or orders from our warehouses in North Carolina and Salt Lake City. We are currently stocking over 2,000 of our top items in Dallas. We will continue to add more inventory as time goes on to create an even more seamless and convenient shopping experience. Check out the video below to see more of the warehouse and our new process!